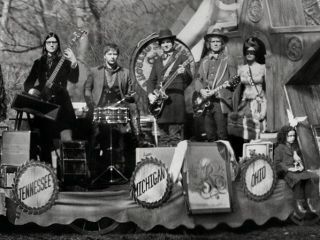 The Raconteurs: A techno album seems unlikely. If you'd asked us to predict who The Raconteurs would be duetting with on the B-side of their new single, never in a million years would British soul singer Adele have come into our reckoning. However, this is indeed happening - the flipside of the 7-inch version of Many Shades Of Black features the same song, but with additional vocals from The Brits School alumnus. You can buy it now from The Raconteurs' webstore. This strange collaboration seems to suggest that Jack White currently has something of a fascination with female soul singers. As you're surely aware by now, he's also to be heard sharing vocals with Alicia Keys on new Bond theme Another Way To Die. If we were Duffy, we'd be waiting by the phone.